Finding the right venue for your party can mean you have to compromise on so many important factors, such as the number of guests, the date, the location, the décor or food and entertainment. However, Allspan’s private clients know how to party the proper way…..in a beautifully decorated and prestigious event tent. There is nothing more personal than inviting guests to a unique location with a venue that has been designed and built to your own personal specification. Event lighting is, of course, a must and we offer a special design service for both interior and exterior lighting. Unlike the traditional marquee hire service, Allspan’s event tents can be installed in almost any location, any time of the year. This is thanks to the cassette flooring system that we use inside our structures, which provides a solid and levelled base underfoot, giving the impression of a permanent building. We also provide full heating during the autumn and winter months, meaning you can party any time. Our event tents are ideal for Fireworks displays, Corporate Christmas Parties, New Year Events and even Winter Weddings. If planning your party and considering all the logistics is not your forte, we can help. We can take care of all your party planning needs, using our specialist event partners, who can provide an equally professional service to Allspan. We can then work closely with these partners to ensure your event goes without a hitch. All you need to do is relax and enjoy the party the proper way! 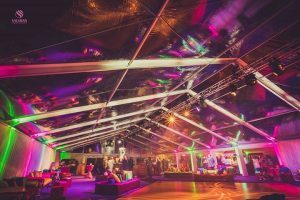 Contact our team for advice on how to create the ideal party venue with our range of superior event tents. Just starting to plan a Christmas event or private party during the festive period? Well, you may have found that securing a venue when party season is in full swing is almost impossible. 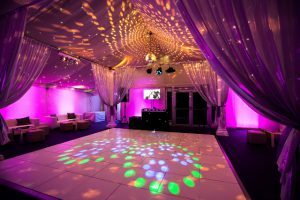 If you are struggling to find a party venue in Kent, Surrey, Sussex, London or Essex, then fear not. Allspan is currently taking bookings for Christmas party event tents. Simply research your ideal location and we will carry out a site survey. The survey will determine if the location is suitable for one of our event tents. There are hundreds of fantastic venues across London and the South East that provide a spectacular setting for parties, and even though the nights are long, the outside space can be beautifully lit to make the most of the idyllic setting. Using event lighting, we can create a magical atmosphere inside and outside of the main event tent. There are many locations to choose from for your outdoor autumn/winter events and parties, but if you need some help, then no problem, we have a few suggestions for you to explore. Why not consider an existing venue that has an outside space? Indoor venues may be booked up well in advance, especially around Christmas, however, many of these venues do not utilise their outside space during the autumn and winter months. Therefore, a popular venue could offer the perfect outside to locate an event tent for your party. Having a party at home can be incredibly personal and enjoyable for you and your guests. If you have an outside space – either your own garden or larger grounds – then your home could be transformed into the most exquisite party venue. It’s worth exploring your local farm as a potential outdoor venue for your autumn, winter, spring or summer event. The rustic setting is incredibly popular for all types of events. For Christmas parties, a farm with animals and stables is an especially fitting location! Sporting grounds are very practical for autumn and winter events. In particular, motor racing circuits and proving grounds offer substantial hardstanding areas, with accessible parking for all your guests. There are many rooftop gardens belonging to hotels, restaurants and businesses throughout London. 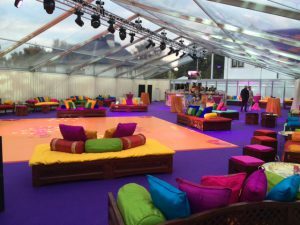 In the past Allspan has installed an event structure on a roof terrace in London to create a temporary venue. You too could host a party with views of the London skyline. Places of interest, such as castles, zoos and parks often provide a venue hire service. Imagine, hosting a spectacular party in an iconic location, it would certainly be well attended! Golf Clubs provide a picturesque setting all year round and are often open to hosting private functions during the autumn and winter months. Wherever you choose to have your private party, it’s important that you use professionals that understand that only perfection is good enough – just like Allspan! Take a look at our range of marquees, temporary structures and event tents here. Here’s some inspiration for your part event tent….